On the southern shore of the Mediterranean lies Tunisia, a country with a history as long as any of its neighbours. The sandy beaches of the Mediterranean, hints of the vast expanses of the desert that extend deep into Africa, museums and antiquities from the Greeks, Romans and Arabs and bustling street markets where haggling is the norm. A North African mystique runs through the country and overruns your senses. 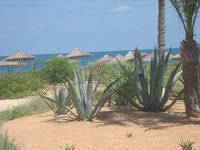 Two of the best places to stay at are Skanes and Sousse. Skanes is a suburb of the town of Monastir, full of shops and restaurants. Sandy beaches are within walking distance of the Hotel Primasol Golden Beach and the Ramada Liberty Resort Hotel, and both hotels offer easy connections to the international golf courses near them. Bars and restaurants can be found inside the hotels themselves, as well as pools for children and adults, water sports and other beach activities, all easily available. Sousse is a busy town built around a walled medina and fort, considered to be the best in Tunisia. The relaxation of North Africa pervades the atmosphere at Hotel Kaiser, which is only 400 meters to the shops, restaurants and cafes of Sousse. There is also the potential to go windsurfing and parascending, if you prefer that to sunbathing and relaxing by the pool or on the sun terrace. Temperatures are high early on in the year, so don't wait till high season. The earlier you book the better off you are. The Third Man is alive and well.